Panettone and Prosecco - the perfect combination! Our gorgeous gift box makes a fabulous Christmas present for foodie friends, relatives and colleagues and contains our favourite fizz – a bottle of organic vegan Prosecco as well as a delicious vegan panettone. Organic Prosecco (750cl) This wonderful organic, bio-dynamic, natural Prosecco comes from the Veneto region of Italy. It has flowery, fruity scents, is slightly cloudy and a beautiful, straw-yellow colour. Vegan Panettone (500g) Handmade in Milan from an artisanal recipe and exclusively for Vorrei, this very special organic panettone is full of flavour and incredibly light and fluffy. 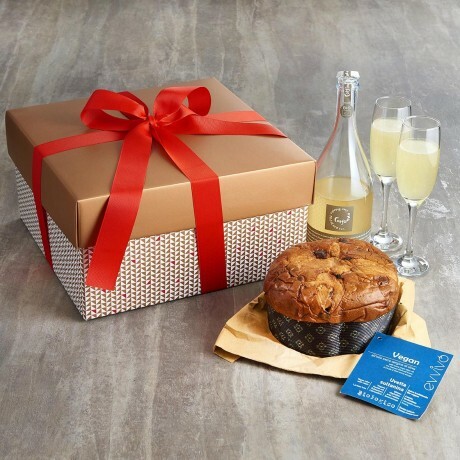 Our prosecco and panettone are presented in a strong gift box tied with a ribbon. A gift message option is available at the checkout. Please note that if we are out of stock of any item we reserve the right to substitute it with the most similar available item. Hamper does not contain glasses.